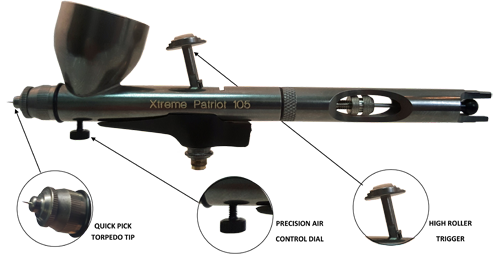 The Xtreme Patriot, Model 105, If you've been looking for an easy to use, workhorse brush for detailed spraying, you've found it! The Badger Extreme Patriot 105 airbrush is the latest airbrush from Badger Airbrushes. The NEW High Roller Trigger is super responsive and will allow you ultimate control of your paint flow for detailed spraying. The 0.3 Needle/Nozzle combination provides a wide spray pattern from hair-line to 2". The atomization combined with the angle of the tip parts gives it a very fine, controlled spray. The tip of your needle is exposed when the trigger isn't pulled back, so you'll want to use the provided protective tip cover and protective case when you're not using the airbrush. The 'Accuracote dark ice' body coating is easy to clean and is a cool gunmetal gray with a satin finish. The 'Torpedo Nozzle Tip' allows for super-quick and easy tip-dry removal if your paint has a tendency to dry on the tip. The NEW Precision Air Control Dial enables fine tuning of your airflow for varied spray pattern effects. This can allow you to go slower while doing detail work or achieve effects such as stippling.